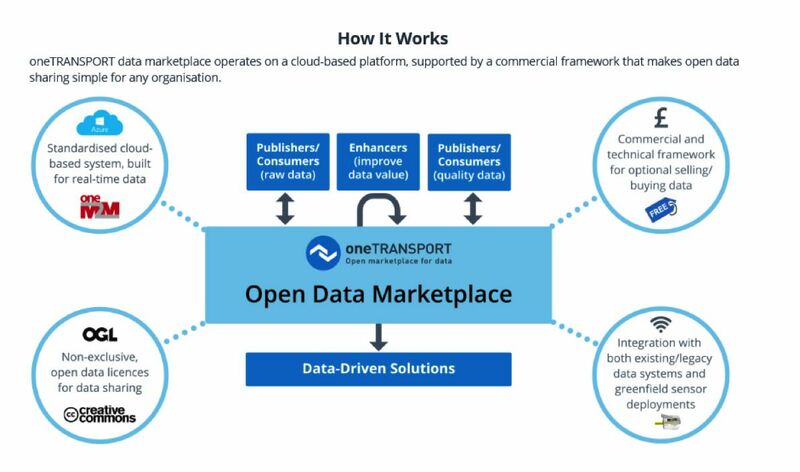 OneTRANSPORT provides an ‘open marketplace’ for sharing data, enabling new data-driven intelligent mobility services to be discovered and created. The project is aimed at suburban and rural local authorities who may not have the resources – whether capital or operational revenue budgets, skills or knowledge - to create and operate their own data platforms, unlike major cities. Potential benefits include more efficient transport network utilisation, improved customer experiences and better infrastructure planning, for example. Cities can also benefit through a better understanding of flows of commuters and people delivering goods into and out of the city. Local authorities pay a subscription to join the marketplace, obtaining access to other local authorities’ data and services in return. Data sharing via an ‘open marketplace’ by suburban and rural authorities, to enable the development of data-driven intelligent mobility services. Dynamic Internet of Things (IoT) data in real-time or regularly updated, plus static data sets. The data can be used by organisations to develop and deliver services. Local authorities pay to put data on the platform and in turn get dashboarding and visualisation services, data checking and access to others’ data. Third parties can also access the data to develop services. Technology provides a common platform for local authorities and third parties to access data. It is a public and private sector partnership between local authorities, InterDigital (main technology partner) and others. Interdigital developed the platform and the commercial model, as well as acting as data broker. Arup provided expertise about the transport sector and was involved in project management. Other organisations developed analytics. Local authorities were involved as end users. A federated approach to data platforms, for platforms that share a common standard. A common data sharing agreement between local authorities and the platform, with 12-month licence agreements created for local authorities. At the end of 12 months, the data is portable and to an international standard. OneTRANSPORT was conceived in 2013 and developed with Innovate UK and private sector funding. It emerged from a recognition that better use of data for transport solutions was required, and for this, technical, commercial and legal frameworks would be needed to enable data exchange across many organisations and individual data platforms. The involvement of the first four local authorities was been funded by Innovate UK, and this part of the project ended in November 2017. Interdigital launched the platform as a commercial data marketplace in February 2018. A consortium of 11 organisations was involved in the project, including InterDigital, Arup, Imperial College London, a number of SMEs, four local authorities and Highways England. Interdigital was the lead partner and developed the platform and the commercial model, as well as acting as data broker. Arup provided expertise about the transport sector and was involved in project management, developing the business case, evaluating direct and indirect benefits and project dissemination. Four organisations carried out analytics including Trak, an SME that is transferring expertise in financial sector analytics, previously used to predict share prices but now being used to predict journey times. The Transport Data Initiative, a community of local authorities chaired by Buckinghamshire County Council, provided a forum for sharing lessons, for example about license agreements or data. Three use cases were developed. The first two use cases enable better management of traffic flows during major events at Silverstone Circuit and Watford Football Club. 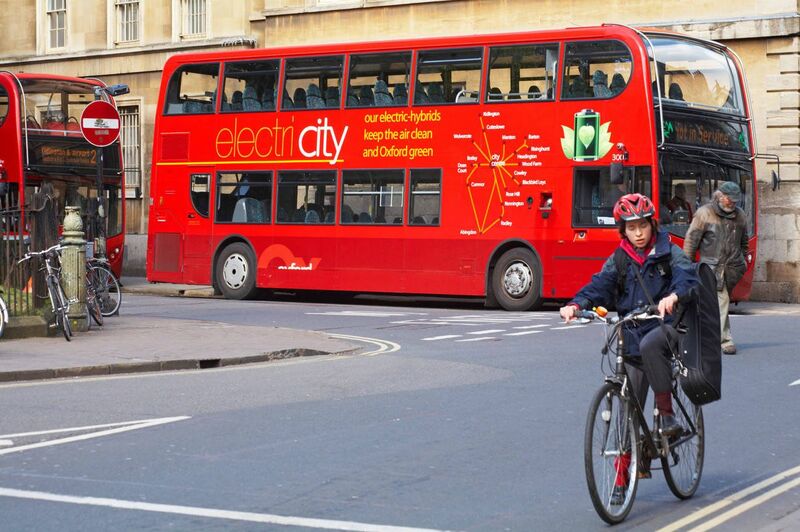 The third use case gives Oxford City Council the ability to provide information on transport options for travellers coming into Oxford city centre, with the aim of increasing the use of bus services and the park and ride. Travellers are given the necessary information to make better informed choices, and there is also potential to influence modal share by offering incentives to customers to use different modes. The platform allows the traveller or transport authority to buy outcomes and services rather than equipment, while the private sector develops the equipment. Local authorities pay a subscription to put data on the platform, and in return receive dashboarding and visualisation services, a certain level of data checking, and the ability to see other local authorities’ data. The more local authorities that have joined, the lower the cost to an individual local authority and the greater the value as they are able to access a larger pool of data. The platform therefore relies on the development of an ecosystem of local authorities. However, it is a challenge to encourage local authorities to join before there is a critical mass of data, after which the true benefits will emerge. It is only once this critical mass occurs that the private sector analytics providers and app developers can create services that are useful. The use cases are important in demonstrating the benefits to local authorities. They may not understand the benefits from opening and sharing data, and will also need to justify expenditure on the service. The local authority could be a provider or consumer of data. While some believe that all local government data should be free, if a local authority has invested resources in cleaning or enhancing the data then selling the data may allow them to demonstrate value for money. The platform developer has a range of challenges: developing the business case, but also developing the platform itself, curating data and providing data services. The platform developer also has the role of a data broker. If a data provider puts a price on data, the broker will pass that through to the person prepared to pay for it, but without the broker paying for the data themselves. It is important that the broker does not interfere with the data so that they are not seen as a gatekeeper to the data. Furthermore, the platform should not provide too many services that might be perceived to be in competition with the private sector who want to access the platform. The app developer creates services from the data. Their success depends on the number of ‘hits’ to their app, which may in turn depend on the geographical extent of the data. They therefore rely on lots of local authorities joining up and providing their data. Services such as data cleansing or aggregation can be outsourced to SMEs or larger firms. The aggregated data might be placed back on the platform as a value-added data source. SMEs and others who are creating services need to pay to access data; this limits the number signing up and therefore the administrative burden. The project is considering organisations paying to access data for six months. A different pricing structure for SMEs and larger organisations is needed. The project attempts to address the challenges of siloed and poor-quality data, creating an open, scalable system that counters the prevalence of proprietary systems in the past. The platform is using oneM2M, an international standard for machine-to-machine communications that supports a federated approach to data platforms. For example, data from the OneTransport platform could be shared with data on platforms developed by other technology firms if they use the same standard. There is potential to bring together data from a diversity of data owners. In the transport sector, there may be hundreds of data owners in England, including local authorities, public transport authorities, logistics companies, airports, universities, private car parks and local authority car parks. In the future, there will also be data from connected vehicles. There is also potential to use data that has not traditionally been used in transport, and to use legacy data, although conversion to the necessary format would require expenditure. For the first time, oneTRANSPORT has brought together national highway data, local authority traffic data, and supplemented it with temporary Internet of Things traffic sensors. It has demonstrated how that data from legacy traffic sensors and new IoT sensors can be integrated and visualised within the same platform. The four organisations involved in carrying out analytics trialled different types of analytics on the same data, allowing them to test which is most appropriate for different applications. It showed that with one platform there could be many analytics firms developing proposals for services. Where the analytics work identified missing data, sensors were added to provide that data. The project helped to ascertain what datasets are required to obtain useful information from the data analytics. The platform reduces the administrative costs associated with sharing data. The local authority has one data sharing agreement with the oneTRANSPORT platform, rather than numerous data agreements with app developers or analytics firms. Conversely, an app developer can access data from four local authorities, say, with one data agreement. Licence agreements of 12 months are created for local authorities. At the end of 12 months, data is portable and to an international standard. In other cases, agreements may be longer. The intention is to avoid the situation where local authorities lose the rights to their data and have to buy it back. The combination of a short-term license agreement and open standard gives rise to a risk for Interdigital but benefit for the project: a local authority could take back data and put it with another platform; conversely, these factors provide greater potential to attract others to the platform and build up a critical mass. Data agreements were developed as part of the project. The local authority specifies the data that they want to be discoverable. There may be certain data that local authorities only want to share between themselves. Alternatively, there may be certain data that they allow everyone to see but at a price. All data is anonymised. With regard to the data agreements, it is important that the data remains the property of the data owner or originator. However, if somebody uses the data to create different kinds of data and add value, that is then the new provider’s data, and they can sell it back or give it away. Cleansing is adding value, but whether the cleanser then owns the data needs to be clarified. If the cleanser has not been paid by the originator, then that could become their data as they have invested in it. If that organisation has paid for them to clean data and put it back on the platform, then it remains with the data owner. The project has shown how 11 partners have successfully worked together without a contract between them, instead using a collaboration agreement for the joint outcomes of the project. There is a lot more data than people believe. However, a lot of data is of low value. There is quite an expense involved in maintaining real-time data feeds. Local authorities need revenue budgets to keep the data flowing. The main lesson learned is that a sufficient amount of data is needed to carry out the various activities.